Much in life is based on the ability to perceive stimuli from the environment and to react to it. Receptors assume an important function. Now, while studying a specific class of receptors, scientists from the University of Würzburg have made an unexpected discovery. A receptor sits in the cell membrane and reaches out into the surrounding space. If a particular molecule or protein, such as a hormone or neurotransmitter, floats past, dissolved in the plasma, the receptor registers it and passes the information on into the cell interior. The cell can react and initiate biochemical reactions. This is probably the mental image that many people, especially lay people, have when they think of a receptor. 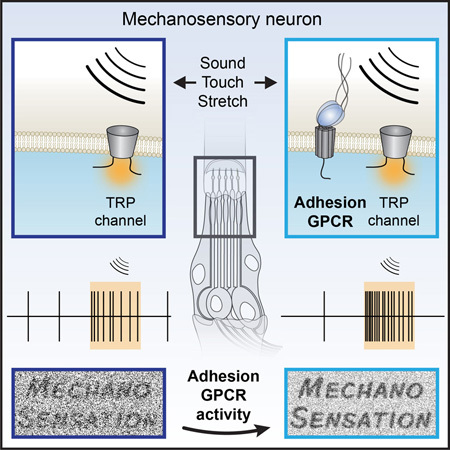 Adhesion GPCRs seem to behave differently: These receptors respond to mechanical stimuli from the environment, such as vibrations, sound waves, or a stretch, and help organisms to hear, to perceive movements, and to control their own motions. Scientists from the University of Würzburg have now proven these abilities for a large class of receptors that had not been suspected of such properties previously. They report on their discovery online in the latest issue of the journal Cell Reports. G-protein-coupled receptors, GPCRs for short, are the focus of the work performed by Dr. Tobias Langenhan and Dr. Robert Kittel. More specifically, their attention is directed at a special class of this receptor super-family, known as adhesion GPCRs. In a DFG research unit, headed by Langenhan, the two are examining the properties of these receptors together with scientists from the universities of Leipzig, Mainz, and Erlangen-Nuremberg, and the Amsterdam Medical Center of the University of Amsterdam. The research unit started work just under six months ago, and the first set of results are now available. “Hundreds of G-protein-coupled receptors are encoded in the human genome, and the way in which they work is very well understood,” says Tobias Langenhan. One indication of their importance is the fact that around half of all clinically approved drugs target these receptors and, in doing so, treat ailments as varied as, for example, hypertension, asthma, and Parkinson’s disease. It is very different with adhesion GPCRs: although they are the second-largest class within the GPCR family, so far they are “poorly understood,” says Langenhan. The research unit’s objective is to change that. The scientists have now been able to present an initial, surprising result to the public: “We were able to demonstrate that a special receptor from the group of adhesion GPCRs is involved in the perception of mechanosensory stimuli,” says Robert Kittel. Or, to put it another way, when organisms hear, perceive slight touch, or move, such GPCRs are at play. In their study, the scientists focused on the larvae of the fruit fly Drosophila. “In these creatures we removed the very gene that encodes the receptor Latrophilin and replaced it with modified variants,” is how Langenhan explains the procedure. Next, the researchers observed the behavior of the larvae in as much detail as possible. This revealed, for example, that larvae missing the receptor displayed a distinctive pattern of movement and covered shorter distances than the healthy control group. Instead of moving forwards in a purposeful manner, they just swung their heads over long phases. In a further experiment, the researchers took a more detailed look at special cells of the larval nervous system which are responsible for perceiving vibration stimuli. The finding there: larvae without Latrophilin receptors exhibited significantly weaker electrical responses than larvae that possess these receptors. A similar picture was found to do with hearing: Larvae without receptors required far louder signals for a flight reflex compared with healthy specimens. “Everything suggests, therefore, that these receptors register movements of the extracellular space in comparison with the cell and transmit this information to the cell interior,” is Robert Kittel’s summary of the results. Like a ship dropping anchor on the sea floor, adhesion GPCRs dock on surrounding structures and react if their “arm” is stretched or compressed. What slightly complicates the work of the scientists here is the fact that in the case of receptors an “all-or-nothing principle” does not apply. “It is not the case that larvae missing Latrophilin are deaf and incapable of moving,” explains Tobias Langenhan. Instead, the receptors would intervene in the respective processes in a modulating manner, amplifying or cushioning them. Robert Kittel and Tobias Langenhan believe that the results of this study represent a significant step on the road to classification of adhesion GPCRs. There are 33 varieties of them in the human body. There is much to suggest that there, too, they assume tasks similar to in fly larvae. For example, they can be found in hair cells in the inner ear. If they are missing or defective, the persons afflicted develop something known as “Usher syndrome,” a disease associated with early onset inner ear deafness or deafness from birth. The new findings, in Langenhan’s words, are a good basis for now “developing further models and testing them in experiments.” After all, he says, there are still numerous unanswered questions in relation to receptors, such as how the signal is transported within the receptor and what “biochemical cascade” is triggered. Or why the receptors often break up into two parts during its production, but appear reassembled at the cell membrane. Scholz N, Gehring J, Guan C, Ljaschenko D, Fischer R, Lakshmanan V, Kittel RJ, and Langenhan T (2015) The Adhesion GPCR Latrophilin/CIRL Shapes Mechanosensation. Cell Reports 11:866-874. 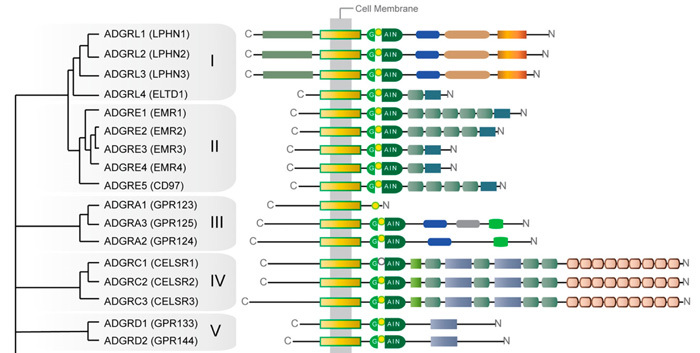 In a joint community effort, the Adhesion GPCR Consortium together with the FOR 2149 have revised the irregular nomenclature for Adhesion class GPCRs. New names were assigned to all mammalian aGPCR homologs, which are now marked through the unified gene name prefix ADGR (Adhesion G protein coupled Receptor). The new nomenclature takes effect immediately and will be adopted by the Human Genome Organisation (HUGO). The nomenclature was published as part of a comprehensive review on the receptor class in Pharmacological Reviews. T he DFG has granted the establishment of the Research Unit (Forschergruppe) 2149, which will focus on the elucidation of the signalling behaviour of Adhesion class G protein-coupled receptors (Adhesion-GPCRs). The Research Unit is a collaboration between laboratories from 9 principal investigators based at four German universities: Würzburg, Leipzig, Erlangen-Nürnberg and Mainz. Throughout the first 3-year funding period the Research Unit will investigate Adhesion-GPCRs in 8 projects. 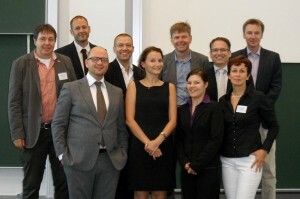 The Research Unit will be supported by Mercator Fellow Dr. Jörg Hamann from Amsterdam. For further information please refer to the press releases of the DFG and the University of Würzburg.